Curly girlies answer me this: is your mane impossible to disentangle, way too volumised, and takes up 90% of your selfie? Or er, all of the above? Thought so. 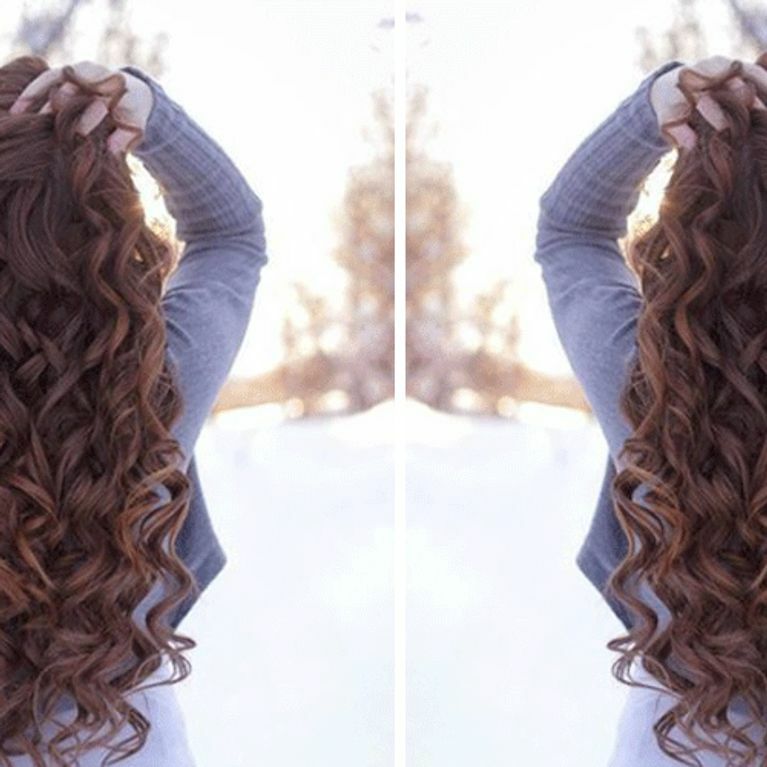 But what if we told you that with a few simple hair hacks (aka showing your curls a bit of TLC), it doesn't have to be such a struggle. Make frizz no longer your 'biz with our simple curly hacks. Chicks with very curly hair may be envied by straight haired girls the world over, and never have to worry about digging out the tongs, but having naturally curly hair is a curse as well as a blessing for some - I'm talking about the issue of endless FRIZZ people. Brush it? You must be joking! But WHY The Frizz though? ...we hear you cry. It's all down to the wiry texture of our curls that makes the hair so dense, flattened and prone to frizz, as the strands are lying along the scalp rather than straight down. In hot countries the scalp is constantly moistened allowing the hair to grow healthily, but unfortunately in our colder climate, the lack of moisture causes a tightening of the pores, concentrating the sebum on the level of the scalp. This basically leaves the hair smothered and dehydrated causing it to peel, while the rest of the hair becomes more and more dry and curly, resulting in us running straight to the nearest hot tool to try and tame it, 'cos in GHDs we trust, but in the long run this just weakens the hair and makes the problem worse. Ah how we love a catch 22 situ. So what can we do to fight the frizz for good? Add our top tips to your regime and you'll be the owner of glossy curls even Queen Bey herself would be proud of. Pinky promise! To make your curls behave, it's best to use products that are specially tailored to very curly hair to ensure your getting the best from the formula. Look for prods that are super moisturising - anything containing any type of oil (argan, coconut, nut oil for example) all work wonders - the more oil the better. For washing try Shea Moisture Coconut & Hibiscus Curl & Shine Shampoo, or Redken Curvaceous Hi Foam Shampoo. It goes without saying that you should always use a serum after washing and conditioning: we heart Bumble And Bumble Curl Defining Creme. Once a week, treat yourself to an ultra-nourishing mask containing the shea butter, like Shea Moisture Raw Shea Butter Deep Treatment Masque, to soften and deeply nourish your curls. Before shampooing, let it sit on the hair for at least half an hour and wrap it up in a warm towel. If your hair is extra dry, keep the mask on overnight and rinse when you wake up. Palm, jojoba or monoi oil are all amazing at moisturising and nourishing very dry and damaged hair, so get them on your radar stat. Apply them before you hit the duvet and leave overnight then wash and rinse in the morning, this helps the hair regain vigour and luminosity. We know we have a lot to thank the Moroccans for when it comes to hair friendly hacks, but did you know they also use Rassoul? This treatment, practiced since olden times by the women of the Middle Atlas Mountain Range, restores shine and suppleness to the hair. When diluted in water, the mineral clay forms a kind of mud that foams and absorbs fat thus giving frizz the finger. We're sold! Mix equal parts olive oil, sweet almond oil and melted honey to make a mask. Warm it gently in the microwave, apply to hair and brush through with a wide tooth comb. Leave on for half an hour under a warm towel then rinse with shampoo et voila! Mix or grind half an avocado and half a banana, add an egg yolk and a teaspoon of olive oil. Mix the whole lot together before applying to wet hair, making sure you massage the scalp well to promote healthy growth. Cover with a shower cap and leave to work its magic for 45 minutes to an hour. Apply this mask once a week to restructure the hair and prevent frizz. Is there any scarier thought than having to live without your Tangle Teezer? I'm having palpitations just imagining it! Being thin but concentrated in mass, frizzy hair is hella difficult to brush and breaks easily, which is why you MUST detangle with a wide toothed comb or our aforementioned BFF the Tangle Teezer, rather than a brush. Spray some detangling lotion like Devacomb No-Comb Detangling Spray on stubborn knots first and always work your way from the ends up to the roots when detangling. How do you deal with your curly hair struggles? Let us know @SoFeminineUK!